Well it is here, the last Wednesday of this year! We are still having marvelous weather here, but at least it is cool outside so it does kinda feel like it could be winter. I am just about at the border of the shawl and am hoping that I manage to finish this project before the new year. I am still enjoying this project very much, although the rows are incredibly long right now so progress is pretty slow. I am so thrilled that so many of you will be joining me in this challenge, I can't wait to see all the gorgeous pairs of handmade goodness that will get created over the next year. I will be starting off with a pair of Jaywalker socks and am knitting it with some Hand-dyed sock yarn which I got from a local dyer. My next project which will be started as soon as the shawl is off the needles is Avalanche. I will be knitting this also in some gorgeous locally dyed merino singles. As you may see a pattern emerging I do plan on making a couple of my projects with locally purchased, hand-dyed, hand-spun yarn in an attempt to support my local community. 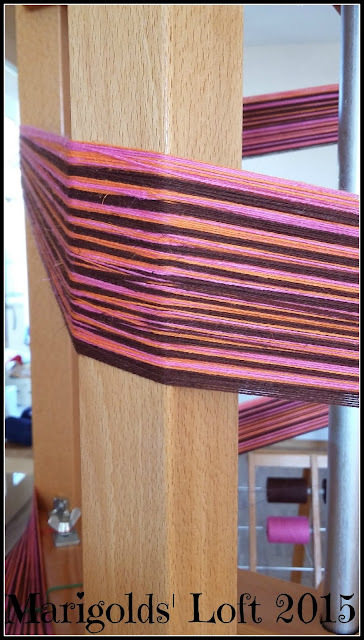 Today, I have also managed to start with a warp for some cute looking Kitchen towels. Reading Wise: I received some new titles from Jas for Christmas and jumped right into the first of these which is Leaving Time by Jodi Picoult. So far I am enjoying the story. Don't forget to drop by on Friday and share your FOs of this week with me, I look forward to seeing what you manage to complete. I will be sharing this post with all of my creative friends for this week, so drop on over there for some great inspiration. I look forward to seeing you again on the other side. I love the yarn you are using in that beautiful shawl. I hope you finish it soon. The yellow yarn is so pretty also. Enjoy your knitting. 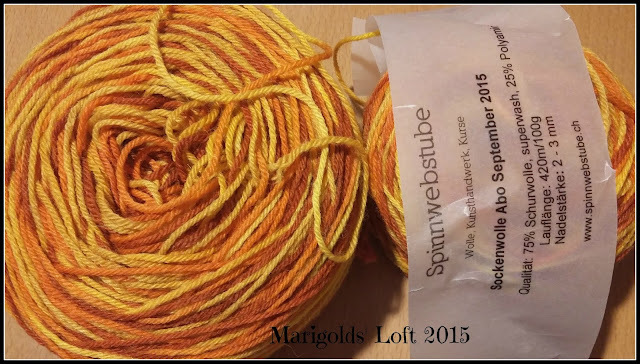 That yellow-orange sock yarn is just amazing. Very welcome during these week of gray skis! I love that you are buying local. I try to do so , too. I actually love the yellow-orange yarn more now than when it was in a hank. Now that I can see the colours I really can't wait to start on the socks. Thanks for your visit, and I wish a happy new year. I love that shawl pattern. I wish I had enough of a gradient yarn to do that. I can't wait to see those towels! Those are real pretty colors you have for your warp. The Wolke 7 yarn that I am using from Wollehimmel (http://en.dawanda.com/shop/Wollehimmel) is the perfect amount for this shawl. I wish you a happy new year, thanks for visiting. your shawl is gorgeous...and red? cant wait to see that! I am working on my list for the sock along and figuring out the yarn I will need. Excited to get started! 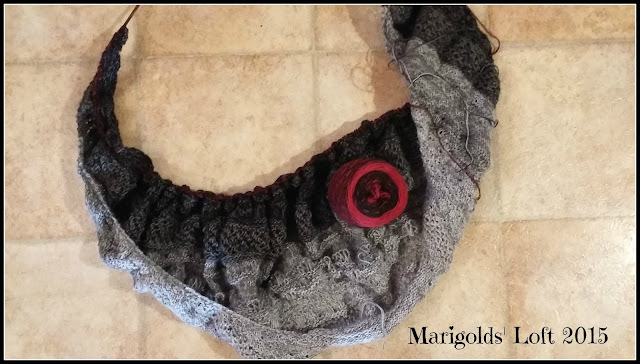 Yes, I love the red, but am not so sure if the patterning will be done justice with the colour combo - I am hoping to get onto the border later today - the braid bit of the shawl is taking forever :O) and then I will see how the patterning progresses. I wish you a great new years eve, thanks for visiting. 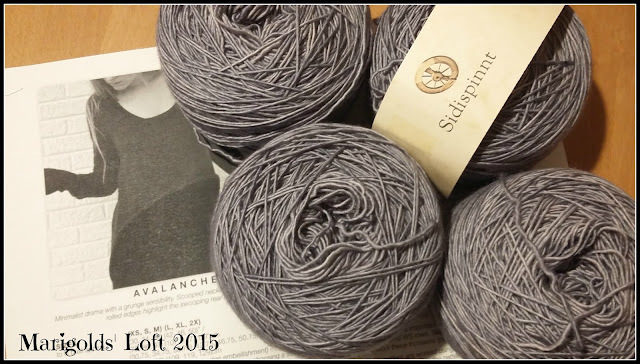 What lovely projects - the shawl will be gorgeous and avalanche looks great, especially in that yarn. I look forward to getting my teeth into the avalanche as the yarn is really gorgeous to feel, I hope to have made a little progress on that by at least the second week of January. Thank you so much for visiting and have yourself a very happy new year. I wish you a very happy new year, thanks for your visit. I hope you have had a great start to your new year. happy new year!! love that you got to the red bit in the shawl :) That is fun when the yarn has colors to get to. Lovely gray yarn you have, I tend to love that color more and more!! I hope to get some more shawl knitting done tomorrow so that I can show you all how it is progressing next week. I too am in love with the grey, it really is a gorgeous hue and I can't wait to see how it knits up. I hope you are having a marvelous 2016 sofar. Lovely projects! I tend to lose the love as I get to the outer edge of a shawl, I have a couple half knitted in hibernation. Funny you should say that, I don't seem to be as motivated to continue knitting the shawl as I was at the beginning stages, but I am going to push myself to finish it before I start my Avalanche. Otherwise I could see it hibernating for a while too, if I am not careful. I hope your are having a lovely 2016 so far and thank you kindly for visiting.